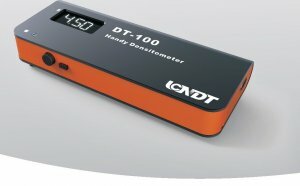 The DT-100 portable densitometer is a robust, easy to use, portable densitometer for measuring the transmission density of x-ray film. The unit has been designed for using in one-site mobile darkrooms, laboratories and offices. The DT-100 portable densitometer, with a extremely wide light range of between 650Cd/m2 and 320 000 Cd/m2, has a density measuring range from 0D to 4.5D with an accuracy to within ±0.03D over an aperture of 3mm in diameter. The operator simply places the film on the viewer (emulsion side up), places the probe on the film where the reading is required and the reading will appear on the 4 digit LCD screen with white light illuminated display. And a low battery warning indicator is provided on the digital display. * We strongly suggest DT-100 work with FV series LED viewers. With FV-2008, the maximum density of DT-100 would be > 5.00D.